Custom Stemless Wine Glasses – Many Styles of Customized Stemless Wine Glasses Available! Our Custom Imprinted Stemless Wine Glass Collection is perfect for bars, restaurants, clubs, fraternities/sororities, promotions, and much more. You can choose from seven different Custom Stemless Wine Glass sizes, including our popular 5 Ounce Custom Stemless Wine Glass and our over-sized 21 Ounce Imprinted Stemless Wine Glass. We use a kiln-fired imprinting process, at heats up to 1,200 degrees, to ensure that your imprints are durable and long-lasting. Your satisfaction is guaranteed when you order Customized Stemless Wine Glasses from us. 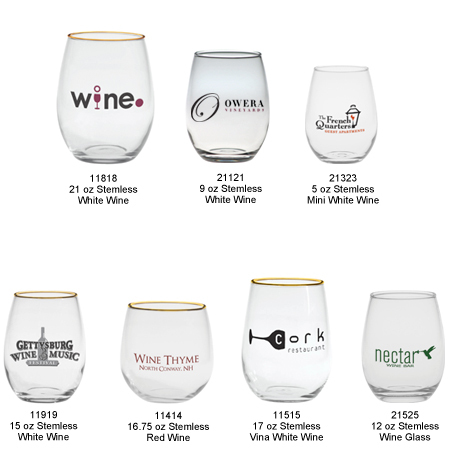 Pricing for Custom Stemless Wine Glasses – Call 1-800-233-0828 for more info or to order! 11818 21 oz Stemless White Wine $2.75 $2.39 $2.29 $2.22 $2.15 $1.99 2" 3"
21121 9 oz Stemless White Wine $2.75 $2.39 $2.29 $2.22 $2.15 $1.99 1-1/4" 2-1/2"
21323 5 oz Stemless Mini White Wine $2.75 $2.39 $2.29 $2.22 $2.15 $1.99 7/8" 2"
11919 15 oz Stemless White Wine $2.75 $2.39 $2.29 $2.22 $2.15 $1.99 1-3/4" 2-1/2"
11414 16 oz Stemless Red Wine $3.06 $2.69 $2.58 $2.50 $2.42 $2.25 1-3/8" 2-1/4"
11515 17 oz Vina Stemless White Wine $3.06 $2.69 $2.58 $2.50 $2.42 $2.25 1-3/4" 2-1/2"
21525 12 oz Stemless Wine $3.06 $2.69 $2.58 $2.50 $2.42 $2.25 1-1/2" 2-1/2"